This recipe is a sure crowd-pleaser and is greatly welcomed at Master Gardener potlucks. 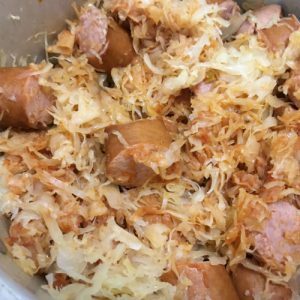 The recipe originally came from my dad’s family, but my mom improved on it! Cook for an hour on medium heat, then lower temperature to simmer until it’s time to serve. A spoonful of cottage cheese tastes great on top. Makes delicious leftovers! Does it sound odd to think of sauerkraut in Central Florida, a place that is known for hibiscus and bougainvillea? Well, cabbage grows well here from late fall through early spring. And we can make our own sauerkraut. This blog post was written by Master Gardeners Celia Beamish and Jan Liles under supervision of the Master Gardener Coordinator and Residential Horticulture Agent Anne Yasalonis. For more information, contact UF/IFAS Extension Polk County at (863) 519-1041 or visit us online at http://sfyl.ifas.ufl.edu/polk. The Plant Clinic is open Monday-Friday, 9:00 am-4:00 pm to answer your gardening and landscaping questions. Visit us in person, give us a call, or email us at polkmg@ifas.ufl.edu. The Florida Master Gardener Program is a volunteer-driven program that benefits UF/IFAS Extension and the citizens of Florida. The program extends the vision of the University of Florida/Institute of Food and Agricultural Sciences, all the while protecting and sustaining natural resources and environmental systems, enhancing the development of human resources, and improving the quality of human life through the development of knowledge in agricultural, human and natural resources and making that knowledge accessible.